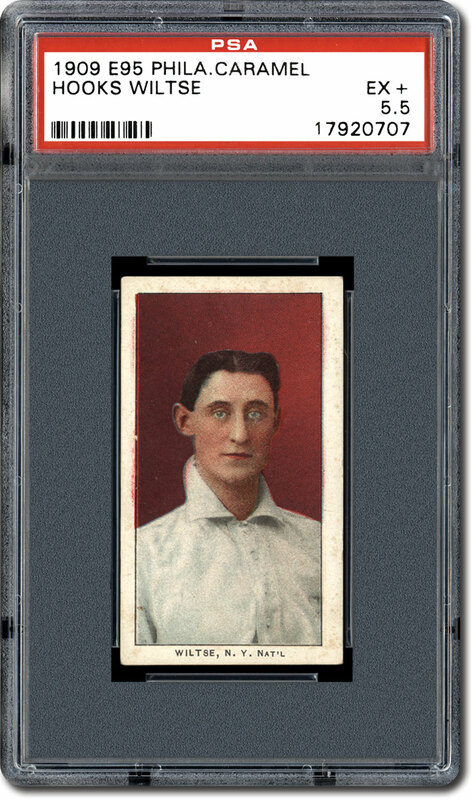 If you want an attractive Honus Wagner card, but like most of us can't afford his storied T206 single, his 1909 Philadelphia Caramel (E95) card might be just what you're looking for to satisfy your collecting needs. This more than century-old single pictures the Pittsburgh Pirates legend in a batting pose against a vibrant yellow background, and it sells for a fraction of the price of his celebrated tobacco card. 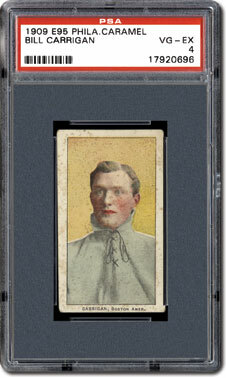 "The E95 Wagner card has a very unique look to it," said Erik Varon, who owns the No. 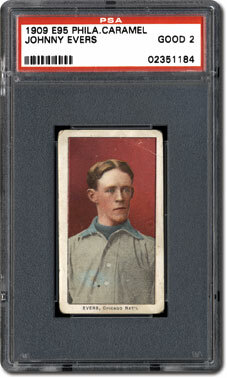 5 Current Finest, 1909 Philadelphia Caramel (E95) set on the PSA Set Registry. "Most of the other Wagner cards of the period had headshots or were portraits like the T206 cards." 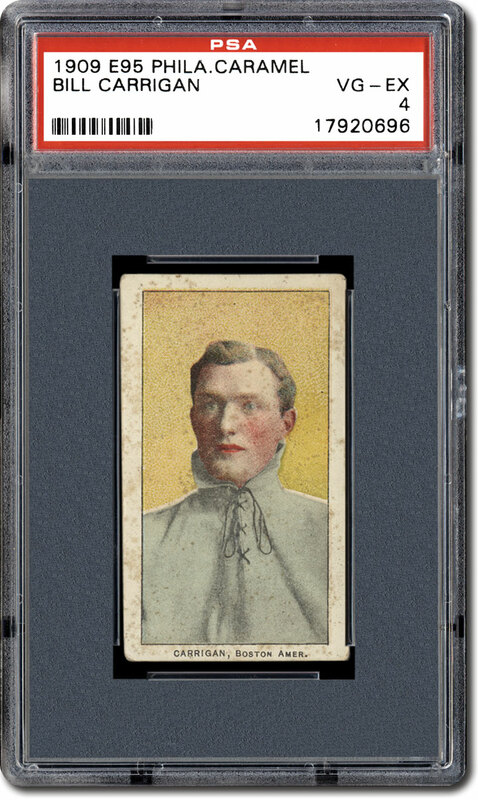 One hundred and six Philadelphia Caramel (E95) Wagner cards have been submitted to PSA and there's just one PSA NM-MT 8 and one PSA NM 7. A PSA EX-MT 6 sold for $13,145 in a Heritage Auctions sale in November 2015. 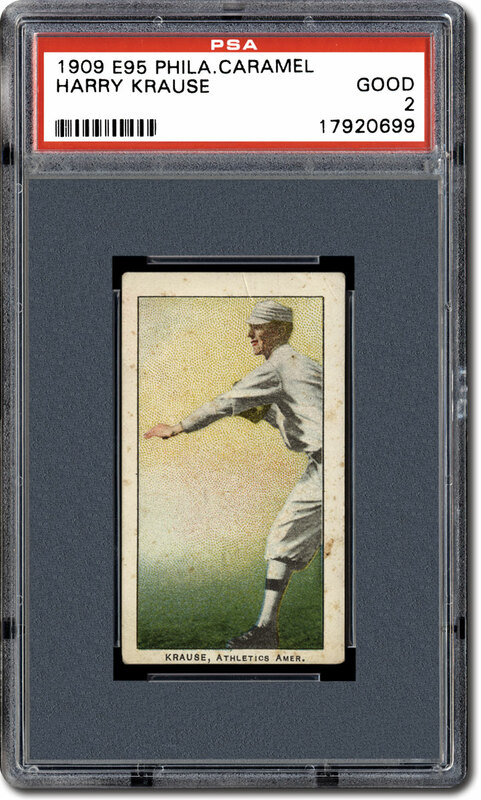 In comparison, a PSA VG 3 T206 Wagner fetched $1.32 million in a Robert Edward Auctions sale in April 2015. 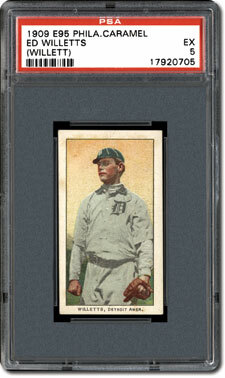 Wagner is one of 10 Hall of Famers represented in this 25-card issue, which was the Philadelphia Caramel Company's first baseball card series. 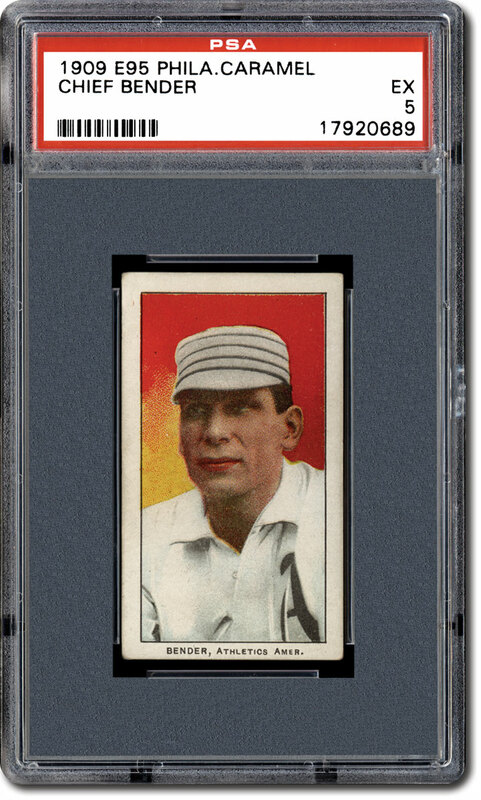 Its size makes it far less daunting to complete than the T206 set. 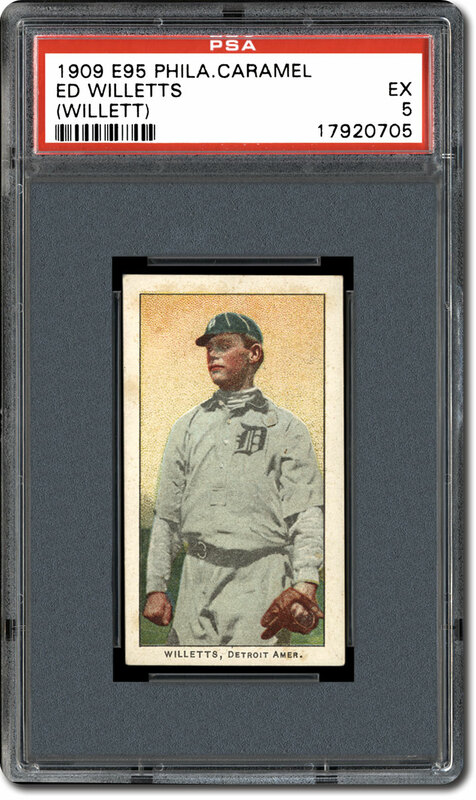 "The T206 set is 525 cards, plus or minus however many cards you consider to be a full set, and that took me so long to complete that I wanted to collect something shorter," explained Wayne Justl, owner of the No. 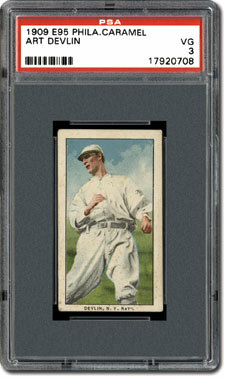 2 Current Finest 1909 Philadelphia Caramel set, when asked why he decided to pursue the E95 set. Varon also appreciates the smaller size of the set. In the summer of 2009, he released a book called, Sweet Recollections: The Story of the Philadelphia Caramel Company of Camden, New Jersey. He notes that the Philadelphia Caramel Co. was established in 1900 by a German immigrant named Jakob Schleicher and his stepson Adolph Ebeling. (Varon has written a biography about Schleicher that he plans to release in 2016.) 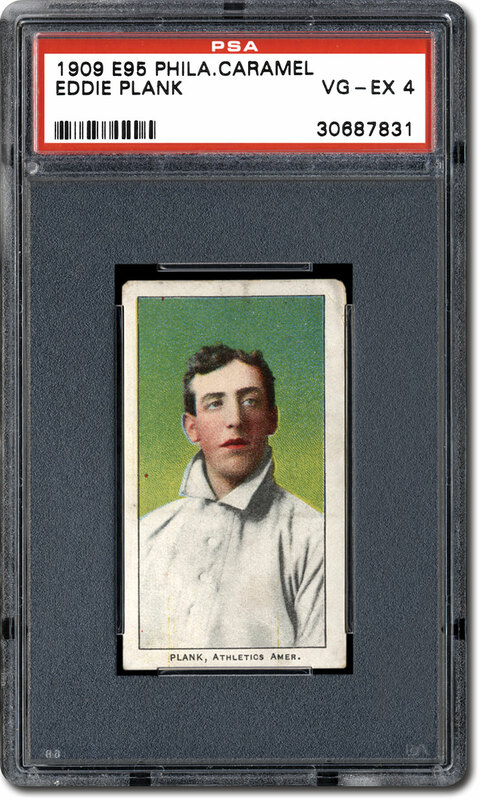 The company's first foray into trading cards came in 1901 when it released four non-sports series, but the E95 set was their inaugural baseball issue. 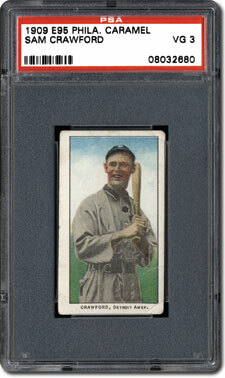 The series was part of a boom of similar caramel cards unveiled by candy companies to help sell their products. Measuring 1-1/2" by 2-5/8", the white-bordered E95 cards feature artistic renderings of photographs against color backgrounds. "The E95 set is just about 50/50 - half of the cards have portraits [for the images] and half are action poses," noted Varon. "Many of the stars are in action poses, which brings kind of a realistic feel to the cards and a fresh dimension to the set." Joel Tschantz, who has compiled the registry's No. 7 Current Finest E95 set, praises the quality of the artwork on the cards. "If you look through this set, the pictures are not generic; they really look like the players," he said. 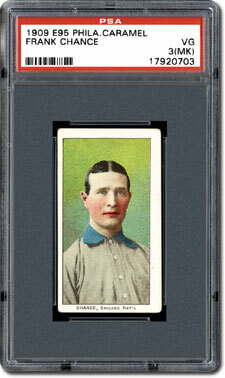 The card fronts also share the player's last name, team city and league at the bottom. The vertical backs showcase a checklist of the 25 players in black print. 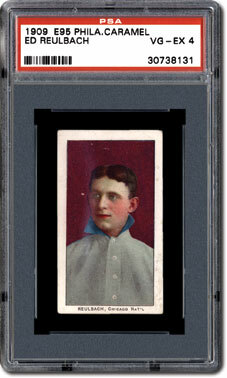 The top of the back introduces the card as "one of a set of 25 ball players cards," while copyright information is included at the bottom. Varon hasn't been able to pin down how the E95 cards were distributed or packaged. "I do know for a fact that many of the E95 cards have residue and caramel stains on them," he said. "But I don't know if they were simply inserted into the package with the candy or if there was some sort of paper or tissue that covered the card." While he has never seen a package for this series, Varon says similar caramel cards were marketed in something that resembled a matchbox. He also believes the E95 cards were widely distributed. "E95s are some of the most common caramel cards. 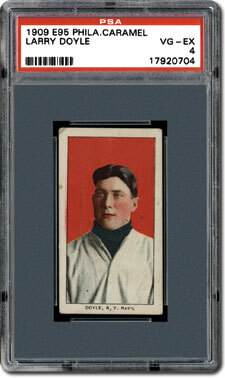 They're far easier to obtain than 1914 Cracker Jack cards, which came out a few years later," he said. It's safe to say that the E95 cards were not distributed until after June 5, 1909. 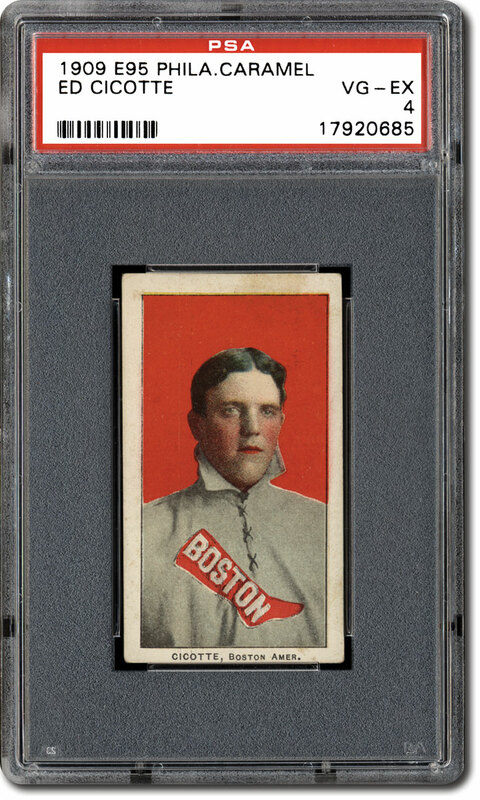 We know this because that's the date that the Philadelphia A's purchased Cy Morgan from the Boston Red Sox, and Morgan's card has been updated to reflect this transaction. 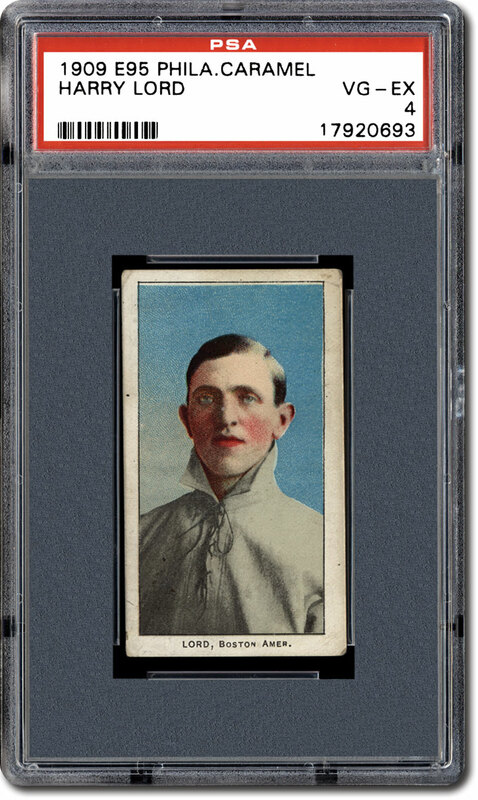 Philadelphia Caramel reportedly released another 30 cards in 1910, and they have become known as the E96 series. The backs of these cards indicate that they are part of a "total issue" of 55 cards (25 cards in E95 series plus 30 cards in the E96 series). So the manufacturer considered these cards to be a continuation of the E95 series. Hobby publications, however, have chosen to list these as separate issues. While there's a checklist on the back of each of the E95 cards, no specific card numbers are visible on the cards themselves. There's also no defined sequencing, and players from just six of the 16 big league teams at the time are represented. The 1908 World Series saw the Chicago Cubs defeat the Detroit Tigers, so it makes sense that these teams are well represented (see accompanying chart). 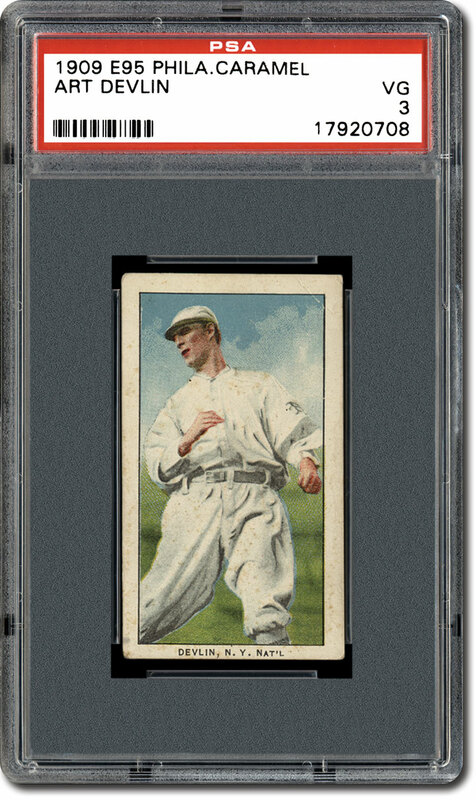 It's also understandable that the Philadelphia Caramel company would focus on creating cards from the National League's top three teams - Cubs, Pirates and Giants - in 1908, but the selection of American League (AL) players is more curious. 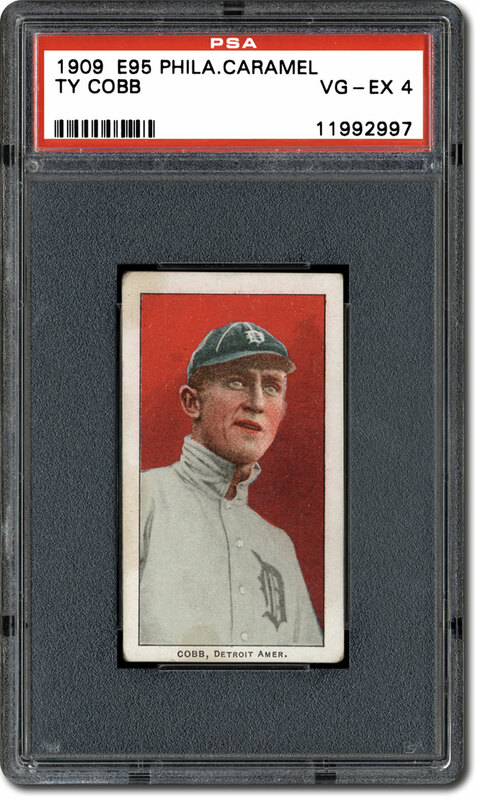 Yes, there are five cards from the reigning pennant-winning Tigers, but the two other AL teams - Red Sox and A's - finished fifth and sixth respectively in 1908. The second-place Cleveland Indians, third-place Chicago White Sox and fourth-place St. Louis Browns are completely ignored. And it's interesting that the Philadelphia Caramel Co. did not include a single representative from the Philadelphia Phillies. The player selection is also somewhat confounding, but the E95 set does offer some solid star power. 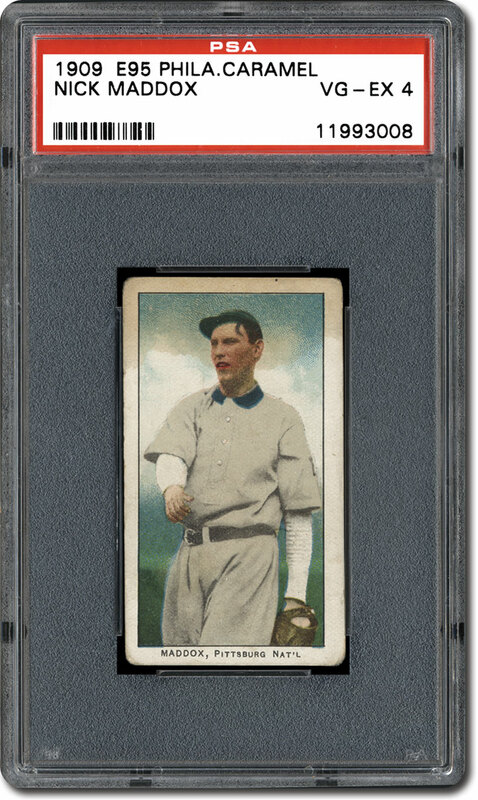 On top of Wagner, there are nine other Hall of Famers in the set: Chief Bender, Frank Chance, Ty Cobb, Eddie Collins, Sam Crawford, Johnny Evers, Christy Mathewson, Eddie Plank and Vic Willis. 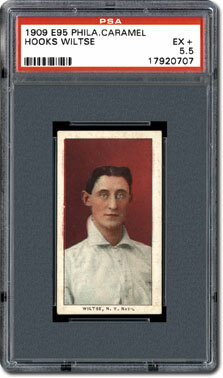 The highly coveted Cobb card features the intense looking batting champ against a red background. "It's a great portrait of Cobb. It's a bust shot, but it's much different than anything else that was produced of him at the time," said Tschantz. "And it definitely looks like him." 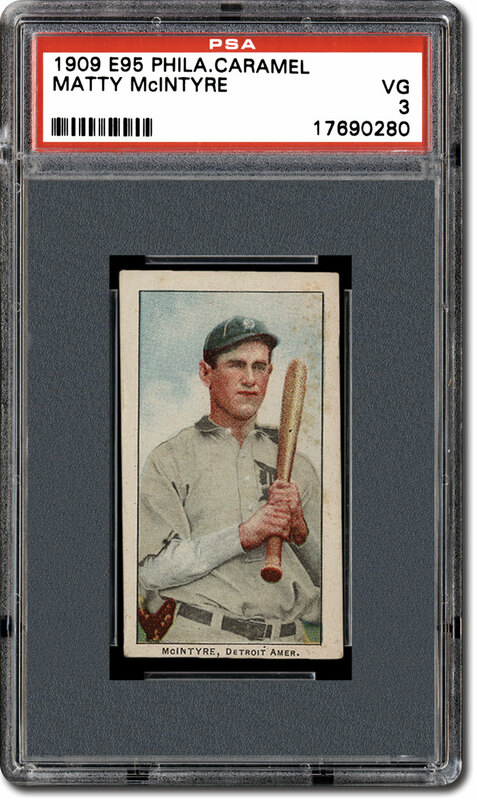 Tschantz has noticed "variances" in the color of the red background on the Cobb card. "The Cobb cards really pop out with the darker and richer red background," he explained. 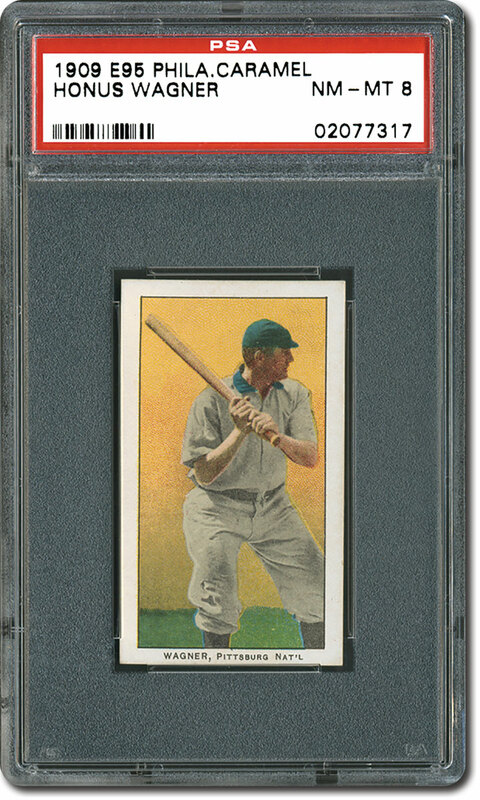 The four PSA 7s are the highest graded examples. 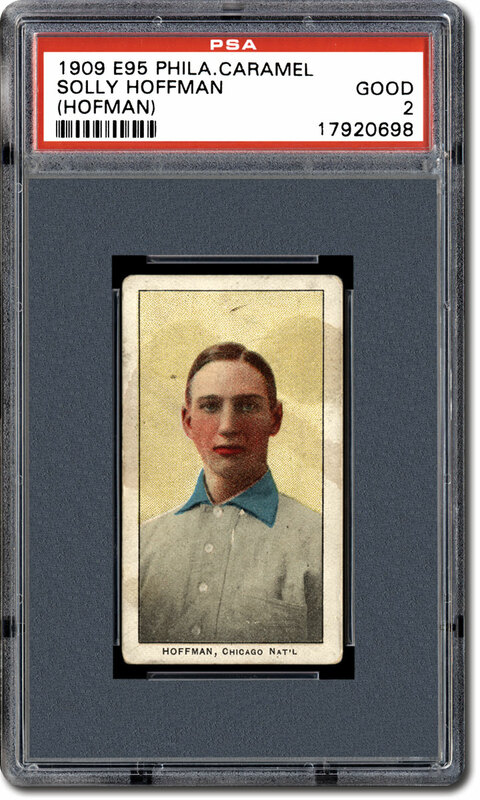 One PSA 7 commanded $21,240 in a Greg Bussineau Sports Rarities auction in December 2015. 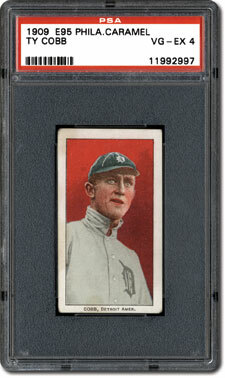 The Mathewson single is also sought after. 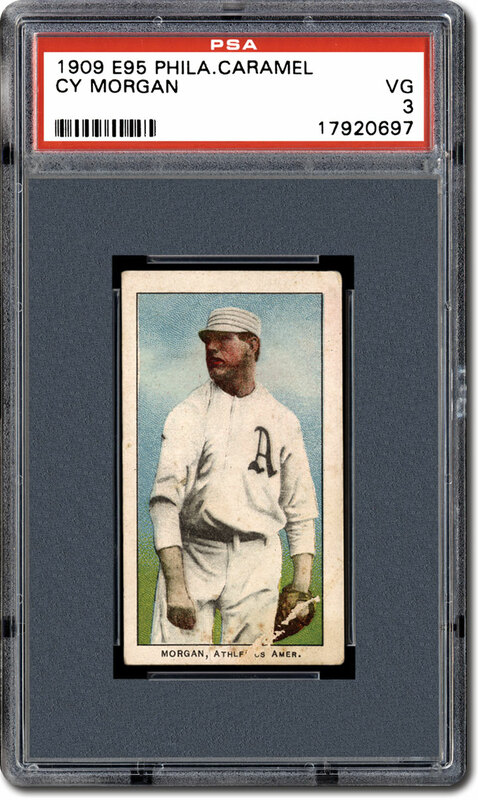 If you look closely, you'll notice that the manufacturer mistakenly included an extra "t" in the pitching great's last name. 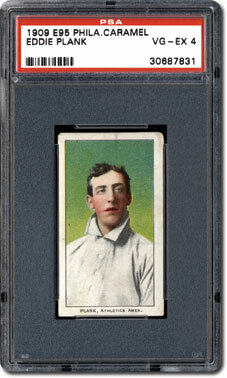 This card presents the legendary right-hander with his glove up against his chest, seemingly poised to begin his windup against a yellow background. "The Mathewson has hugely different yellow variations [in the background]," noted Justl. Like the Cobb card, there has yet to be an example grade above PSA 7. Of 127 submissions, there have been just two PSA 7s. 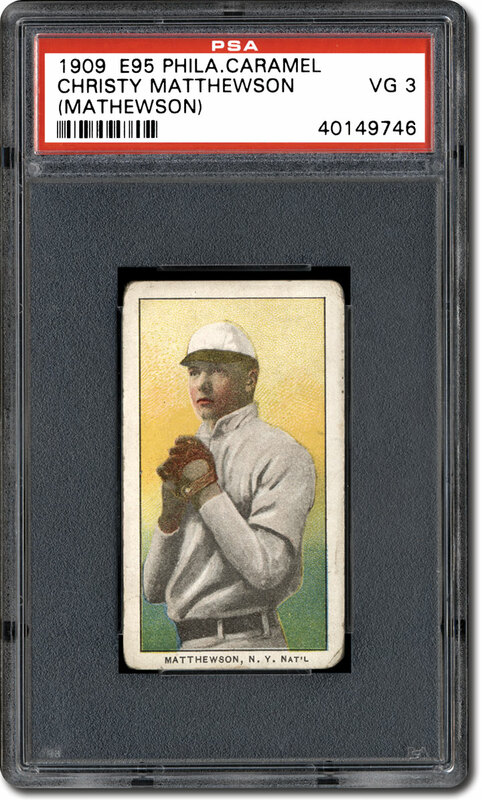 A PSA 6 garnered $4,780 in a Heritage Auctions sale in November 2015. 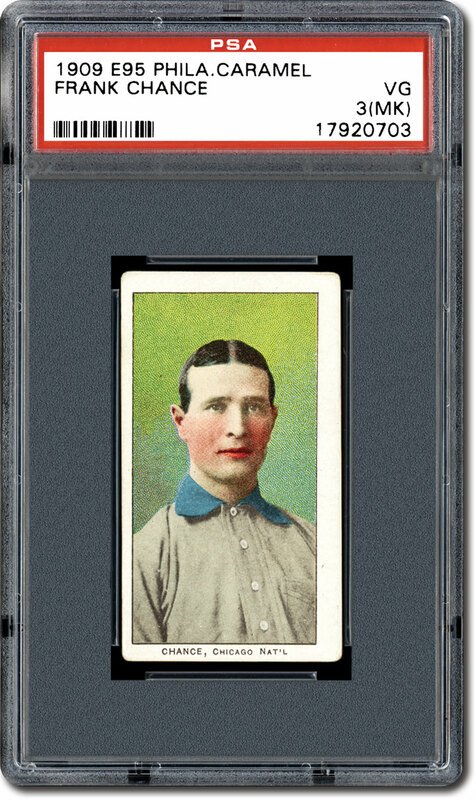 Similar to the Wagner, if you're looking for a more affordable Plank card than his scarce T206 single, his E95 card might be a good option. But the Hall of Fame left-hander's E95 card has proven to be elusive in flawless form. "I've never found a Plank in a [PSA] 6. That's one of the tougher mid-grade cards," said Justl. The sole PSA 7 is the highest graded example. A PSA EX 5 garnered $1,912 in a Heritage Auctions sale in May 2015. Almost as noteworthy as the Hall of Famers in this set are the Cooperstowners that are absent. Cy Young, Walter Johnson, Addie Joss, Nap Lajoie, Ed Walsh, Mordecai Brown and Rube Waddell are among the biggest stars not included. Perhaps the company was limited by the set's size or by the contractual demands of the players. It's also worth noting that Lajoie and Brown are featured in the ensuing E96 series. 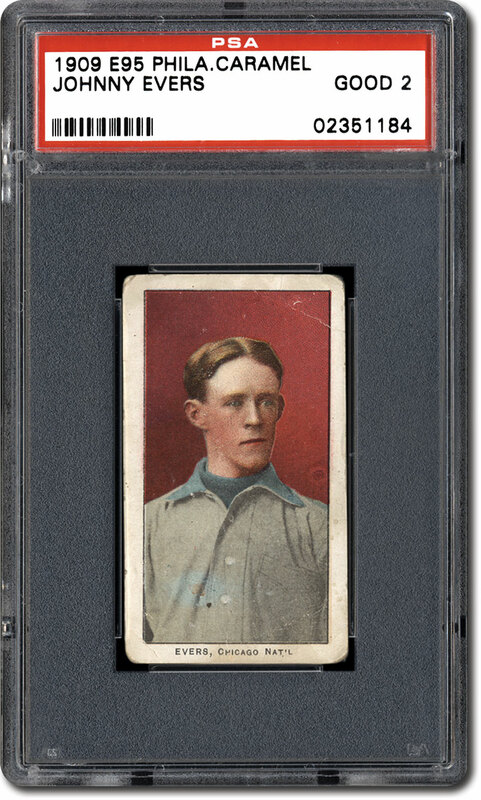 Though not a Hall of Famer, Eddie Cicotte is the subject of another desirable E95 pasteboard. 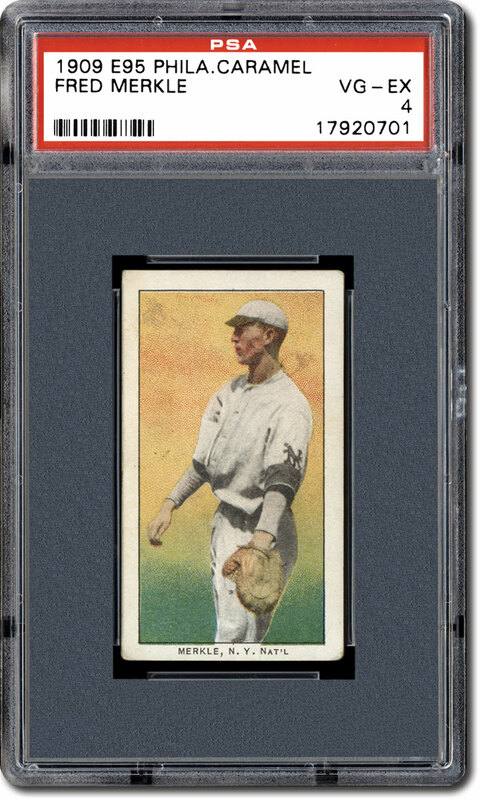 This right-hander amassed 209 wins as a big leaguer, but he's best remembered for his participation in the 1919 Black Sox scandal. "Anything to do with the Black Sox is a big deal," said Tschantz. 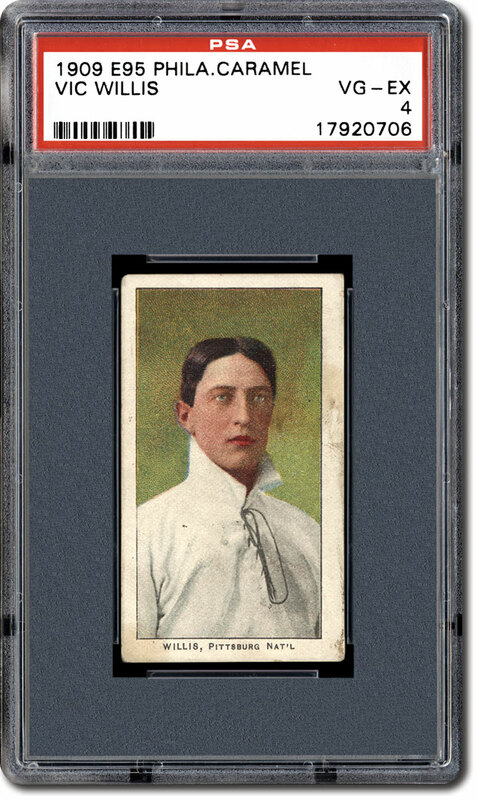 "Cicotte is a guy who's not a Hall of Famer, but he's highly collectible." 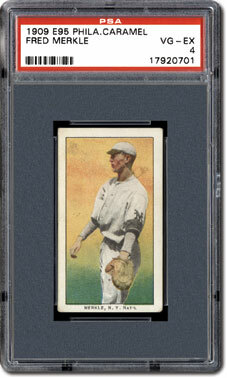 Of the 74 Cicotte cards evaluated, there have been three PSA 7s (nothing grading higher). A PSA 7 sold for $3,346 in a Heritage Auctions sale in November 2015. But it's very difficult to find any card in this set in PSA 7 or better. 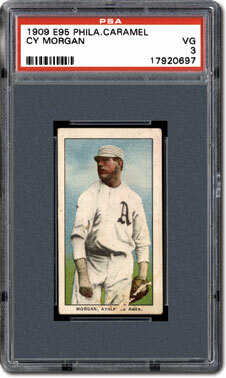 Of the 1,681 cards submitted, there has yet to be a PSA MINT 9 or PSA GEM-MT 10 and there are just 10 PSA 8s. "When you get a caramel card in a [PSA] 5, I think that's something a little more special than a tobacco card," said Varon. 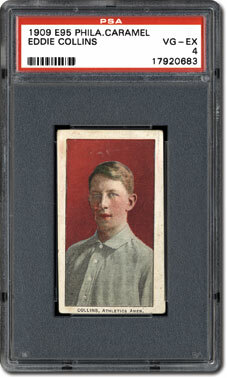 "In 1909 or 1910, tobacco cards were targeted for adults; the caramel cards were for children. And when children get things like cards, they don't take care of them. A lot of them got destroyed or damaged." If you look closely, you'll also spot some further uncorrected errors on these cards. 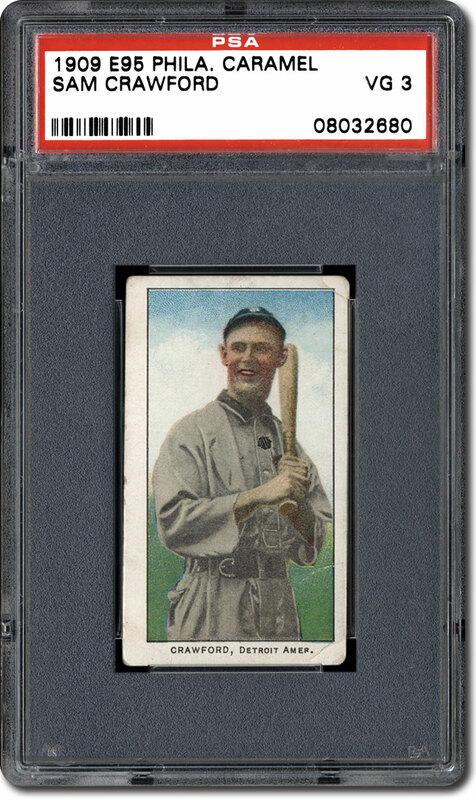 Aside from the Mathewson, there are two other cards with names spelled incorrectly. Ed Willett's name is erroneously listed as "Willetts," while Solly Hofman's last name is presented as "Hoffman." But these errors make this set even more fascinating to collectors. 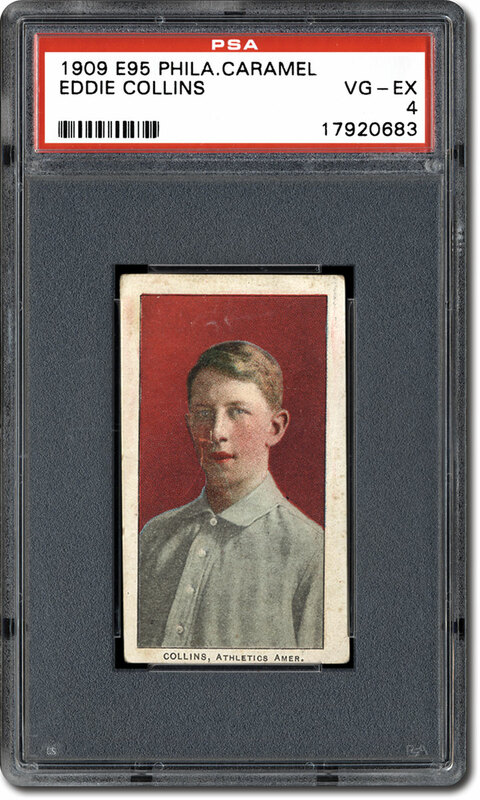 And with its decent crop of Hall of Famers and manageable size, the 1909 Philadelphia Caramel (E95) set is a more affordable option than many of its tobacco contemporaries. "Visually, this is one of the top caramel sets in my opinion. In terms of rarity, I believe it's in the middle," said Tschantz. "But over 30 percent of the players in it are Hall of Famers, and I think that's pretty attractive." Tschantz also thinks this set has a bright future. "I don't think it's a set that's going to double in value overnight, but it's going to have a nice, solid appreciation," said Tschantz. "There's always going to be a demand for anything that's more than 100 years old and is full of Hall of Famers. It's kind of like buying a blue-chip stock; it's just something you can't go too wrong with." Varon offers a similar assessment. "Because of the star power that the E95 set has and because of the unique look to the cards, it's a very well-recognized and widely-collected [caramel] set," said Varon. "I believe that with the research that's coming out and with new collectors coming into the hobby, there's always going to be a demand for the E95 cards.". 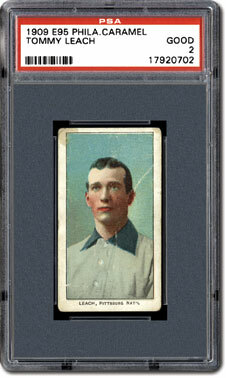 For more information on the 1909 Philadelphia Caramel (E95) baseball set, please visit http://www.psacard.com/cardfacts/baseball-cards/1909-philadelphia-caramel-e95/115. Please feel free to contact Kevin Glew at [email protected] if you have any additional information or comments. Please note that the Population Report figures quoted and Set Registry rankings reported are those as of March 2016.